I eat crispy kale and roasted sweet potato every week. It’s one of those things that I can make without thinking and I know they will come out good! 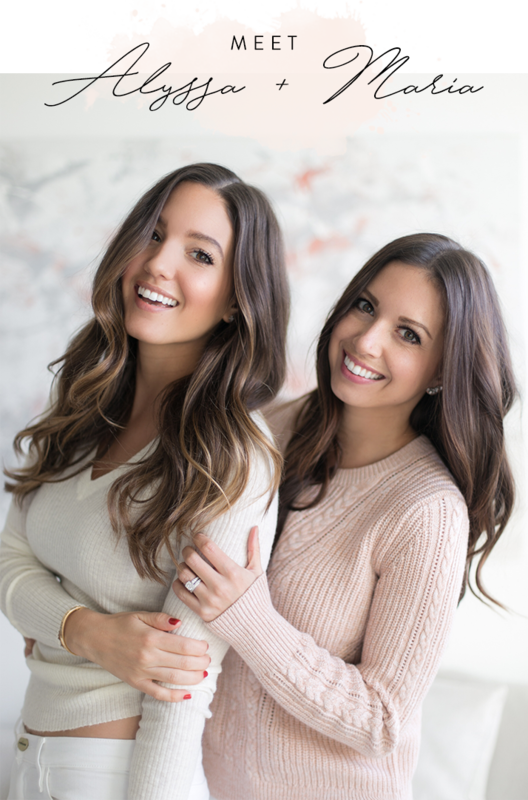 So I am always trying to find ways to switch up the way I eat them, so I am not eating the same thing all the time (even though I totally am haha). So tahini sauce was the game changer this week! I am probably going to be posting three recipes in a row with tahini because I made a huge batch of it. It totally flavors the entire dish! 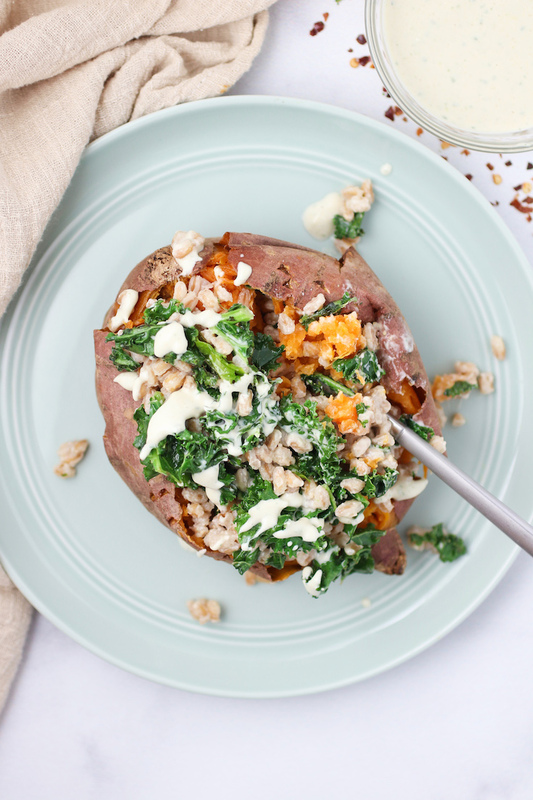 So this time around I baked my sweet potato, stuffed it with farro and crispy kale, and drizzled tahini sauce on top. 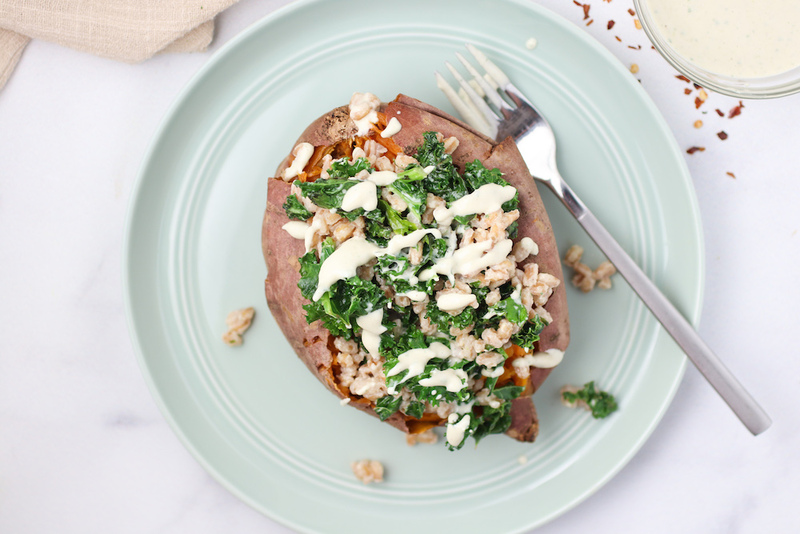 The flavor is amazing, plus it’s an easy and healthy dinner that will totally fill you up. And need a lunch to-go? Make this ahead of time and pack it in your bag! You can eat it warm or cold. Poke a few holes in the sweet potatoes and add them to a baking sheet lined with parchment paper. Bake for 45-55 minutes. Set aside to cool. In a small pot add the vegetable broth and farro. Bring to a boil and then cover and reduce heat to a simmer. simmer for up to 40 minutes, until grains are tender and have absorbed all of the liquid. In a food processor or high speech blender, add all the Tahini Sauce ingredients and process until creamy. Taste test for more sea salt needed. in a pan, drizzle olive oil over medium heat. when hot, add the kale and sauté until crispy. 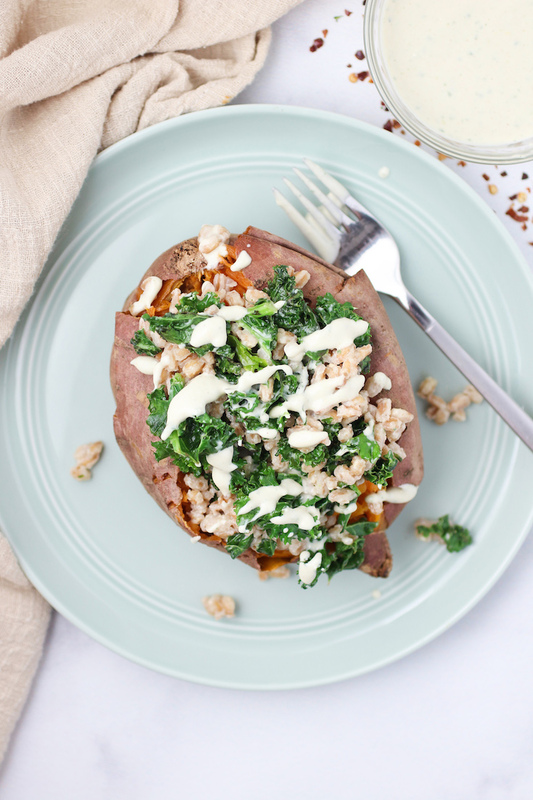 stuff into each sweet potato, and add an extra drizzle of tahini sauce on top. Store the extra tahini sauce in a sealed mason jar or container for up to a week in the fridge!